Bureaucratic elitist hypocrites using other-people’s-money to fund their lavish ‘carbon’ intensive gabfests to protest against ‘carbon’, demanding everyone else curb their lifestyles. For at least 21 years now, the U.N. and the IPCC have been ringmaster to a troupe of thousands. They perform at massive annual conferences held in exotic locations, serviced by top hotels and airlines, and funded largely, directly or indirectly, by reluctant taxpayers. An estimated 45,000 attendees, including 114 from the Australian government, achieved nothing useful at Copenhagen and just more green tape in Paris. Each of these climate-fests is preceded by numerous meetings of bureaucrats drafting and redrafting their wish lists. Now the U.N. Climateer-in-Chief, Ban Ki-moon, has jetted into the G20 summit in China to claim climate victory over climate skeptics. Is there no end to this energy-wasting climate tourism? If they believe that the science is settled, no more conferences are needed. 97% of climate models say that 97% of climate scientists are wrong. I have been a rusted-on Liberal Party voter my entire life, with family members holding various administrative positions within the party over many decades. Outside of family ties, my support for the Liberal party has always been based on its conservative policies and views. With the knifing of Tony Abbott, a true statesman and representative of those trusted conservative Liberal party values, by Malcolm Turnbull, a man whose ideals and views are best described as of the extreme left, the Liberal Party has now 100% lost my vote. It is by no means an exaggeration to comment that the Australian Labor Party (the Left-Wing opposition) is in my mind now a more conservative opposition to the Turnbull led Libs! Or perhaps just, ‘better the devil you know’. As a condition of support for Turnbull toppling Abbott, he promised the conservative arm of the Lib/Nat coalition that he would not lurch to the left on climate. He lied. And he will pay dearly, just like every other leader or opposition leader who has swallowed the great global warming scare and force-fed economy destroying climate policies to the wised-up Australian public. Environment Minister Greg Hunt says he will likely allow the purchase of international carbon credits despite backbench anger over the weekend’s Paris climate agreement. “We have to set in place a mechanism to allow us [reach new targets], in particular to look at the question of international units and I expect we probably will take on board international units and that will give us the flexibility as we head into 2020 to re-pledge if needed,” Mr Hunt said. 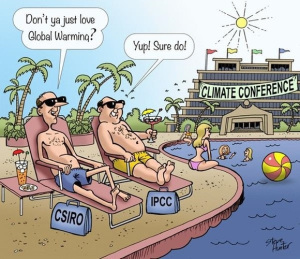 Dr Roy Spencer, former senior scientist for Climate studies at NASA’s Marshall Space Flight Center, and current principal research scientist for the University of Alabama in Huntsville, reports that 2015 will not be “The Hottest Year Ever” despite a strong El Niño …. and even stronger hot-air from the climate alarm industry. Way back in June, John Christy and I called 2015 as being the warmest year on record…in the surface thermometer data. Given the strong El Nino in progress, on top of the official thermometer data warming trend, this seemed pretty obvious. Of course, everyone has their opinions regarding how good the thermometer temperature trends are, with periodic adjustments that almost always make the present warmer or the past colder. Instead, I’m going to talk about our only truly global dataset: the satellite data. With the November 2015 data now in, it’s pretty clear that in our UAH analysis 2015 will only be the 3rd warmest year since the satellite record began in 1979. Based upon my calculations, this will be true no matter what happens in December (barring Armageddon). …if for no other reason than this: thermometers cannot measure global averages — only satellites can. The satellite instruments measure nearly every cubic kilometer – hell, every cubic inch — of the lower atmosphere on a daily basis. You can travel hundreds if not thousands of kilometers without finding a thermometer nearby. With only 3 months left in the year, there is no realistic way for 2014 to set a record in the satellite data. Granted, the satellites are less good at sampling right near the poles, but compared to the very sparse data from the thermometer network we are in fat city coverage-wise with the satellite data. In my opinion, though, a bigger problem than the spotty sampling of the thermometer data is the endless adjustment game applied to the thermometer data. The thermometer network is made up of a patchwork of non-research quality instruments that were never made to monitor long-term temperature changes to tenths or hundredths of a degree, and the huge data voids around the world are either ignored or in-filled with fictitious data. Furthermore, land-based thermometers are placed where people live, and people build stuff, often replacing cooling vegetation with manmade structures that cause an artificial warming (urban heat island, UHI) effect right around the thermometer. The data adjustment processes in place cannot reliably remove the UHI effect because it can’t be distinguished from real global warming. Satellite microwave radiometers, however, are equipped with laboratory-calibrated platinum resistance thermometers, which have demonstrated stability to thousandths of a degree over many years, and which are used to continuously calibrate the satellite instruments once every 8 seconds. The satellite measurements still have residual calibration effects that must be adjusted for, but these are usually on the order of hundredths of a degree, rather than tenths or whole degrees in the case of ground-based thermometers. And, it is of continuing amusement to us that the global warming skeptic community now tracks the RSS satellite product rather than our UAH dataset. RSS was originally supposed to provide a quality check on our product (a worthy and necessary goal) and was heralded by the global warming alarmist community. But since RSS shows a slight cooling trend since the 1998 super El Nino, and the UAH dataset doesn’t, it is more referenced by the skeptic community now. Too funny. In the meantime, the alarmists will continue to use the outdated, spotty, and heavily-massaged thermometer data to support their case. For a group that trumpets the high-tech climate modeling effort used to guide energy policy — models which have failed to forecast (or even hindcast!) the lack of warming in recent years — they sure do cling bitterly to whatever will support their case. So, why are the surface thermometer data used to the exclusion of our best technology — satellites — when tracking global temperatures? Because they better support the narrative of a dangerously warming planet. Except, as the public can tell, the changes in global temperature aren’t even on their radar screen (sorry for the metaphor). The temperature divergence, this century, between NASA GISS temp (land based) and RSS satellite data, is mind-blowing. Looks like someone is adjusting the curve to fit the ‘global warming’ narrative. Gavin? Tom? Between 1979 and 2001, the RSS satellite data increased at virtually the same rate as GISS. Since then, there has been a massive divergence, with GISS claiming that the pace of increase has barely reduced from the earlier period. In contrast RSS (and also UAH) confirm that, if anything, temperatures have been dropping. It’s time to call the fraud squad in. 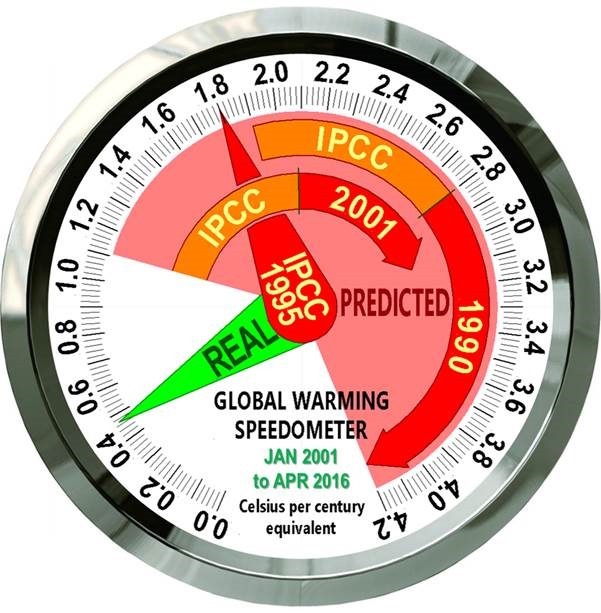 When measuring the temperature of the atmosphere, NASA and the climate crisis industry refuse to acknowledge the much more comprehensive and accurate satellite data sets, UAH and RSS, as both show no global warming at all over the past 20 years. Instead they opt for the UHI effected and massively tampered with, GISStemp land-based data set. Yet to measure sea-level rise, they are more than happy to use satellite data, over (land-based) tidal gauge data, when a glitch in the system fits their warming bias. Shameless cherry picking and the biggest wilful scientific scandal in history. 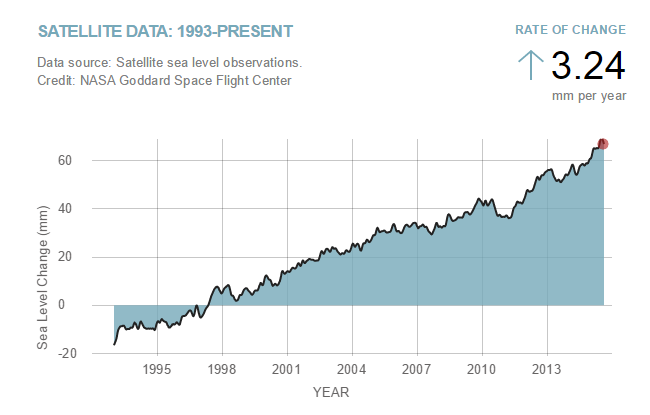 NASA shows 3.24 mm/year sea level rise on their web site. They call it “Facts” – when in fact it is blatant fraud. Until early December 2015, NOAA had this web page up showing about half that much sea level rise. NOAA just made it disappear ahead of COP 21.
the absolute global sea level rise is believed to be 1.7-1.8 millimeters/year. 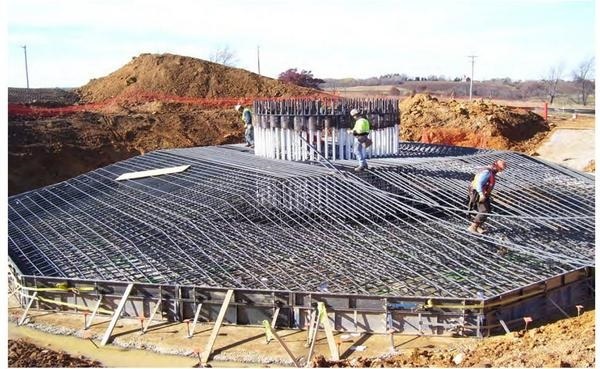 How Much CO2 Gets Emitted to Build a Wind Turbine? Despite a lifespan of only fifteen years, running at max 30% output, an industrial windmill could spin until it falls apart and never generate as much energy as was invested in building it. Sadly however, contradictory facts to the prescribed orthodoxy matter little in the ideological echo charmer of the great global warming swindle. The ONLY justification for wind power – the massive subsidies upon which it entirely depends (see our post here); spiralling power prices (see our post here); and the suffering caused to neighbours by incessant low-frequency noise and infrasound (see our post here) – is the claim that it reduces CO2 emissions in the electricity sector. STT has pointed out – just once or twice – that that claim is nothing more than a central, endlessly repeated lie.